One of the most used apps on Android devices is the keyboard app that pops-up whenever you put your cursor in a text field on your device. All the phones come equipped with at least one keyboard app to help you type on your device and do a few other things. Most keyboards include the essential features that you need to write things on your device. However, if you come from a device that had a great keyboard and your current phone doesn’t offer similar features, you’ll be a little disappointed. For those of you who aren’t happy with the current keyboard on your device, here we have compiled a list of 10 best Android keyboards that you can download and use on your device. Many of these are more than keyboards as they let you do more than typing on your device. 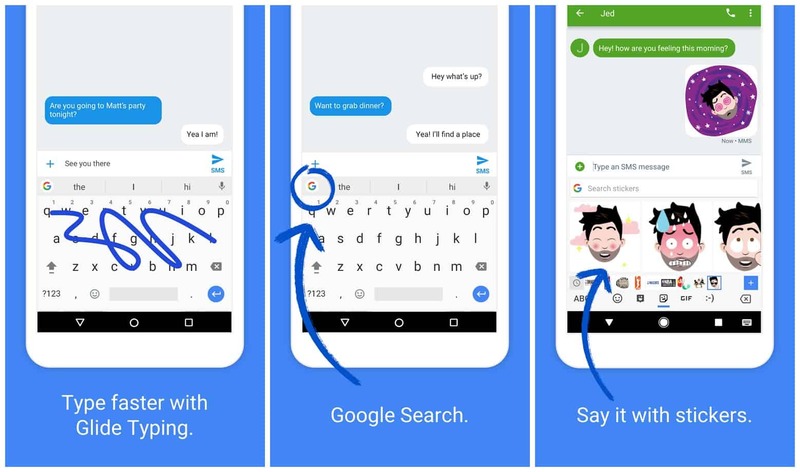 Gboard is the official keyboard for Android devices by Google that comes with many of the basic features that you expect from an Android keyboard. 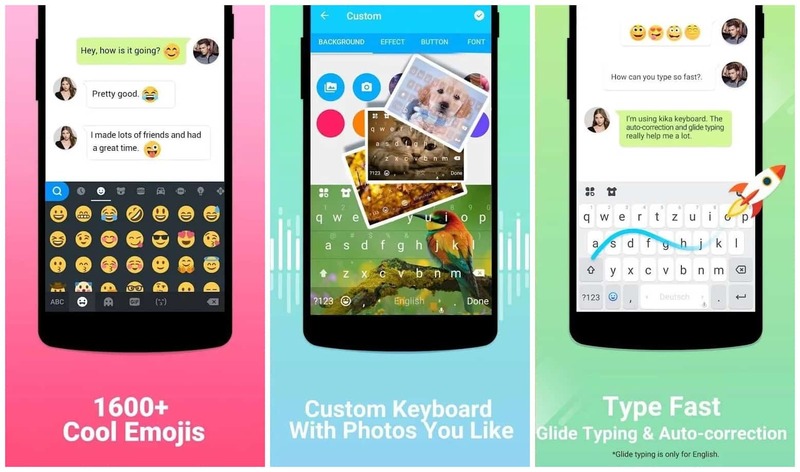 It has got multiple themes to choose from, predictions and features like swipe for your typing, and a GIF search function to help you search for and send GIFs right from the keyboard itself. If the keyboard hasn’t come pre-installed on your device, you can grab it from the official Play Store. 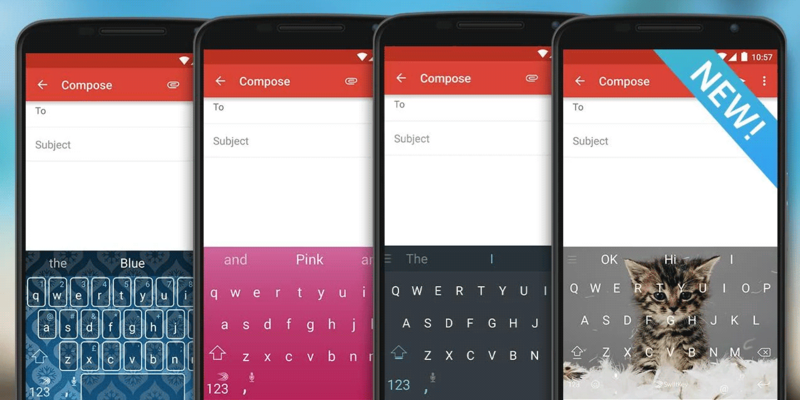 SwiftKey is indeed one of the best Android keyboards out there, all thanks to the excellent features it boasts. 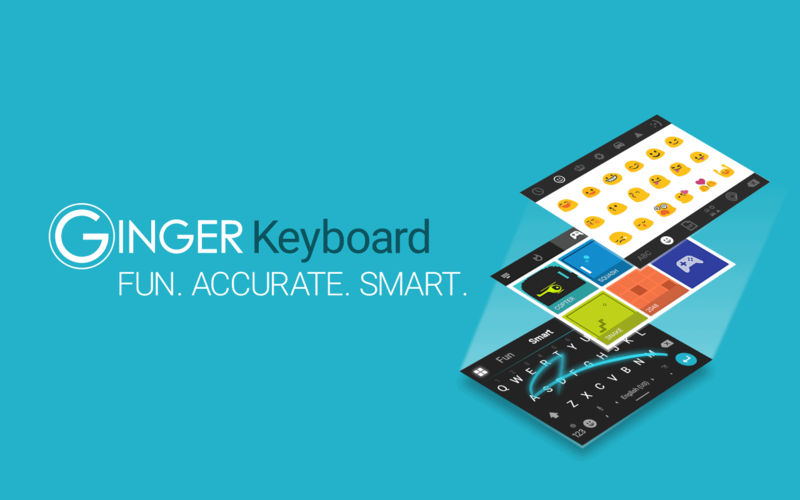 The keyboard has been in the store for quite a long time and it has gained good popularity among the Android users. Some of the features it includes are swipe typing, predictions, autocorrect, and the ability to learn your texting habits so it can give you suggestions for what you can write. Fleksy calls itself the most customizable keyboard and it indeed is because of all the options for customization it offers. It lets you add a new row to the keyboard that can contain either emojis or numbers, web search, support for gestures so more can be done in less efforts, and extensions to extend the capabilities of the keyboard. Not to mention that it has a number of themes for you to choose from so that the keyboard blends well with the color scheme of your device. 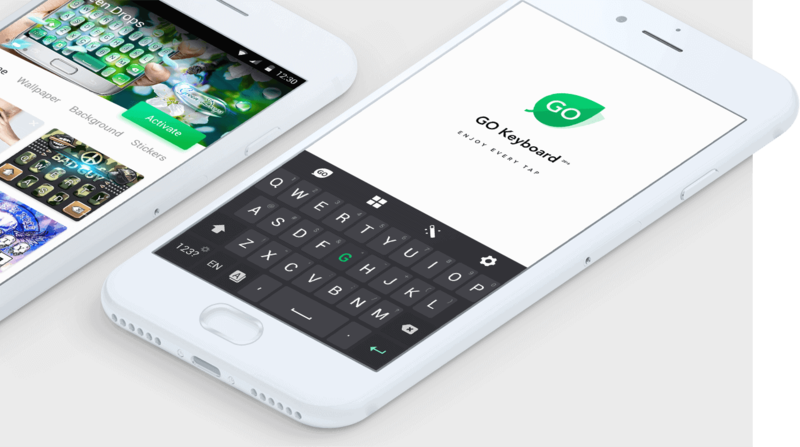 Go Keyboard is for those of you who just love having fun while texting their friends. It’s got a number of themes to choose from, a great set of emojis you can send in texts, and many other cool features that make sure you have a fun experience while typing texts on your Android device. The only thing that you may not like about the keyboard is that it’s got ads and sometimes they pop-up while you’re typing something. But hey, you’re getting a lot of cool things for free so it’s worth it. ai.type, as the name describes, is an AI based keyboard that learns the way you type texts on your device and then suggests you things accordingly. It knows what’s going to be the next word that you will type and it shows exactly that so it’s easier for you to roll on to the next word while typing on your device. It’s got other features as well like multiple themes, emoji support, swipe, and so on. Chrooma is one of those Android keyboards that understands all the elements on your device should blend well to give an overall consistent experience. What’s so great about the keyboard is that it changes its color depending on what app you’re using it in. For example, if you’re using it to type texts in Facebook Messenger, its color will change to blue, and so on. Besides, it’s lightweight, has a number row, emoji support, night mode, and so on. If you love dynamic apps, you’ll love the Chrooma Keyboard app. One of the features that makes this keyboard stand out of the crowd is the addition of games to a keyboard. While typing things, you can trigger in a game to play on your device. That might sound strange but it’s just one of the features the developers of the keyboard thought to add to their app. It’s got a touch of all the features such as AI to help you type texts faster and conveniently, a spelling checker, support for emojis, and a wide range of themes to choose from. 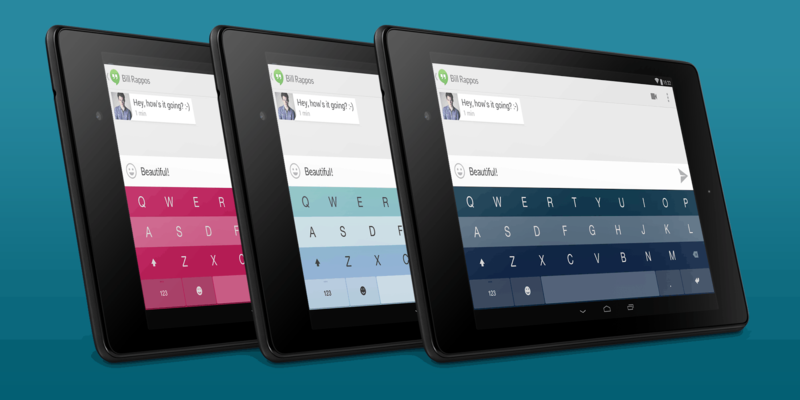 Touchpal is one of those best Android keyboards that’s been in the game for many years. Over all these years, it’s gained many features and has built a loyal user base. Some of the features it offers are contextual predictions, voice recognition, emojis and stickers, and one-hand typing. The last one’s definitely going to be your friend if you’re sick of using both of your hands to type texts on your device. It’s an ad-enabled keyboard but paying a fee will remove the ads from the keyboard. Kika is mainly an emoji keyboard but it also helps type texts accurately on your device. With support for glide typing and auto-correction, you’re less prone to making mistakes while sending texts to your friends. 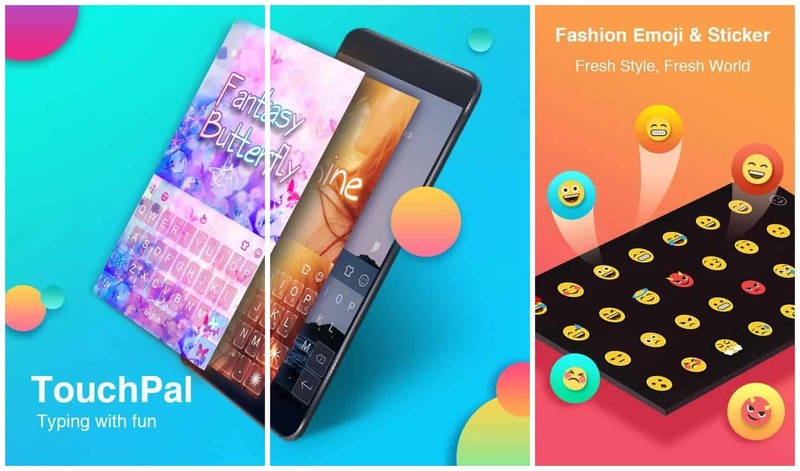 Other features include an ever growing library of emojis and GIFs, a custom wallpaper for the keyboard, one handed and split-screen mode, and so on. If you’re the kind of guy or girl who prefers emojis over texts, you’ll love this keyboard. Typhany makes sure the keyboard looks exactly the way you want by allowing you to create your own themes that you can set for the keyboard. Not only can you create themes but you can also make emojis with emoji maker so your friends get unique emojis they have never seen before from you. It’s a newcomer in the market but it’s definitely a great one to have on your device. 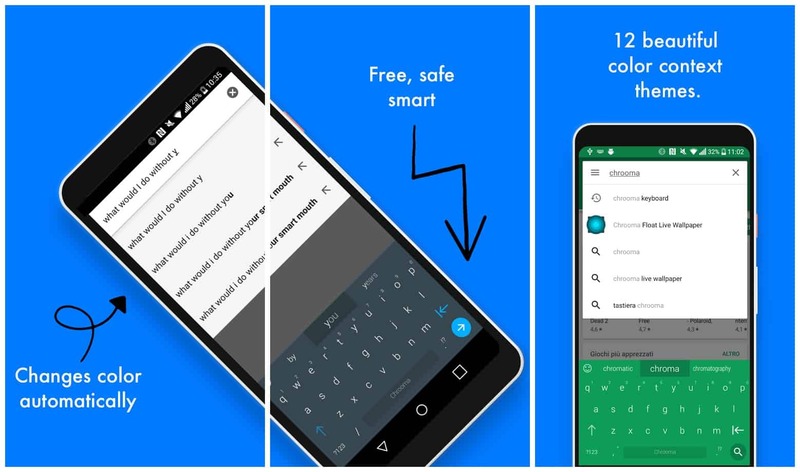 So, above were 10 of the best Android keyboards that you can download and use on your Android device to make typing easier and accurate. If you think we’ve missed a great keyboard app, please feel free to let us know about it in the comments below.